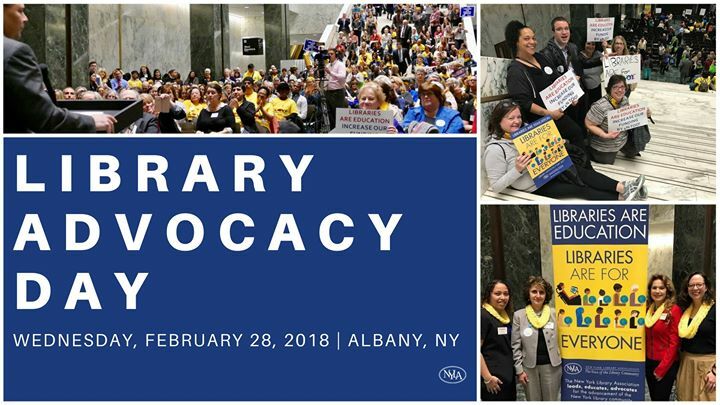 Each year library advocates from across New York State converge on Albany to voice their support for funding and policies that benefit libraries. Their efforts have resulted in over $11M in additional library aid since 2011. Visit NYLA for more information, or stop by a Friends of APL outreach table this month. The Friends of APL are tabling at Washington Ave from 10am – 12:30pm every Tuesday in February. If you’re coming to Albany for Advocacy Day, stop by the APL Washington Ave branch at the Friends Zone to have a cup of coffee with other Library Friends! Most activities take place in the Legislative Office Building (LOB). The LOB is most easily accessed from the Concourse, or through the Capitol Building. Prepare for airport-like security while entering the building. NYLA ‘Base Camp’ will be available in LOB120 beginning at 8:00AM for packet pick-up and sign-in. Library Advocates will meet in the “Well” of the LOB at 12:00 PM for a Library Advocate’s Rally! Can’t attend Library Advocacy Day? Join in virtually! Post to your Facebook wall, Tweet about Library Aid, or add a button to your library’s website. It’s a well-known fact that people who love libraries really love libraries. On Library Advocacy Day this year, the Friends of Albany Public Library are creating a place for library advocates to relax and have a cup of coffee in their favorite place–the library! When walking the halls of the Capitol has got you worn out, stop by the Large Auditorium at the APL Washington Ave branch. The Friends of APL will have coffee and sweets available for Friends groups visiting Albany from 10am until 4pm on Advocacy Day. Tell us what’s going on at your Library and with your Friends group and find out what’s going on here.